I scoff at cat food. When you could serve this. Mommy is also spending every spare moment watching the Gone with the Wind marathon on AMC. What are you up to today? We're napping and playing. Mommy's running around like cray-cray. Pee Ess - Truffle, if it weren't for you long whiskers, we wouldn't have seen you! Oh wow, enjoy yous turkey. And Happy Fanksgivin'. Oh, look who's hiding! Happy thanksgiving! Hee, Hee! Happy Turkey Day! We can see the very tip of your nose! That's a great hiding spot! Happy Thanksgiving! You are much better at hiding than my cat, that's for sure! Happy Thanksgiving! No, I don't see a kitty. I am ashamed to say that I never saw Gone with the Wind- I will have to one of these days. Only whiskers...HAPPY Thanksgiving, Melissa & Truffles! Great haikus! The cute whiskers gave you away, Truffles! Everyone knows that a hidden cat is invisible!! hehe Happy Thanksgiving! yum! Kitty in a bag. I love kitty in a bag. Its pawlicious. BOL! Have fun in your bag and enjoy your dinner. Remember not to eat so much that your tummy hurts. Trader Joe's is the best, isn't it? Happy Thanksgiving hugs to you, friends! We see that adorable nose and those beautiful whiskers peeking out of that bag! Hope you have a wonderful Thanksgiving, Truffles and Mom Melissa! Great Haiku, Truffles!! We is looking forward to having some turkey, too. That looks like a great bag. And I love your haiku! I see some whiskers! What a great bag Truffles" happy Thanksgiving tomorrow. Don't you just love paper bags? I sure do., No one can see me either. Happy Thanksgiving. I see a couple whiskers. Truffle LOVES turkey and is hoping Mom Paula will bring her some from Aunt Dorenda's house. Heh. Wonder what would happen if I pulled that whisker … I slept all day cos TW was too busy to play with me. She made a pumpkin pie and then her and Pop made the stuffing for tomorrow. I think I see some whiskers! And, possibly, part of a nose. We see those whiskers peeking out! I love your Haiku! 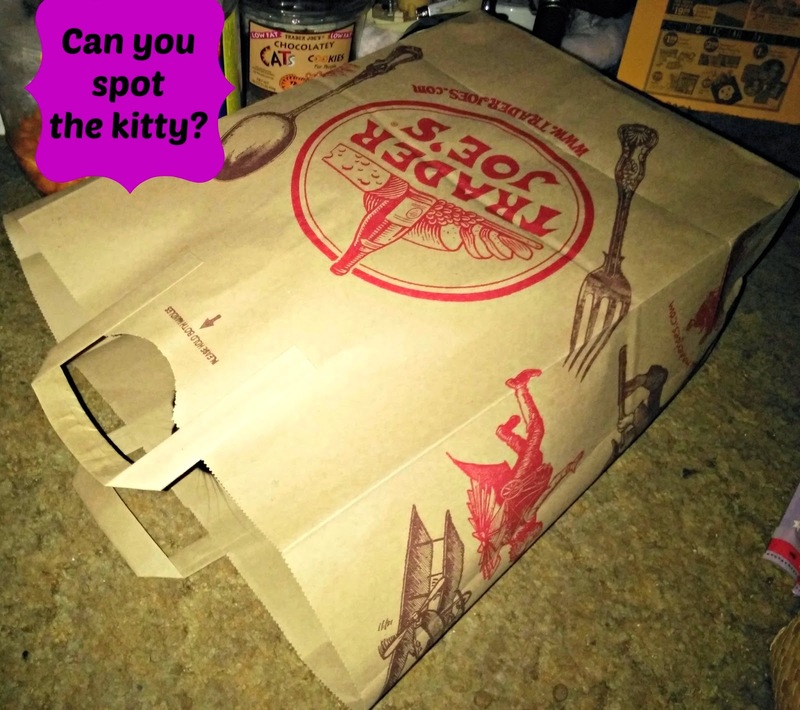 Of course kitty is hiding in the bag - kitty cats LOVE a paper bag don't they? LOL! Hope you had a great Turkey Day.